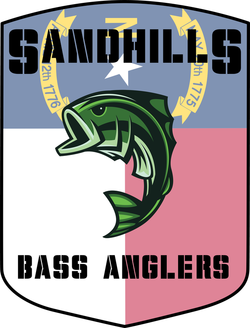 The Sandhills Bass Anglers is an unaffiliated, grass roots organization geared toward the average weekend angler. We strive to offer tournament competition without the time, cost, and commitment required to fish the big trails, or those clubs that fish hours away from our area. Our goal is to help develop the club's members as anglers by openly sharing and teaching each other our own bass fishing techniques. We fish around the Raleigh area to include: Harris, Jordan, Badin, Falls and Tillery. James Hart gets a back to back win on a super windy day at Harris ! Only one event left in the Spring season and the points are close !!! We believe that tournament angling is more than just competing against each other, trying to beat everyone else. We believe that it should be friendly, affordable and fun! The club should give back to its members...to strengthen the fishing skills of all involved! We do this by encouraging an open dialogue between the members to better each other on the water so we all learn to become better tournament anglers.....sharing patterns, lure techniques, and lake hot spots. Our club is open to boaters and membership cost is kept low ($200/year)...because we are not about cashing a paycheck, we're about building a great group of anglers. We fish 12 yearly tournaments to declare an Angler of the Year with a 2 day "classic" tournament at the end of the year.